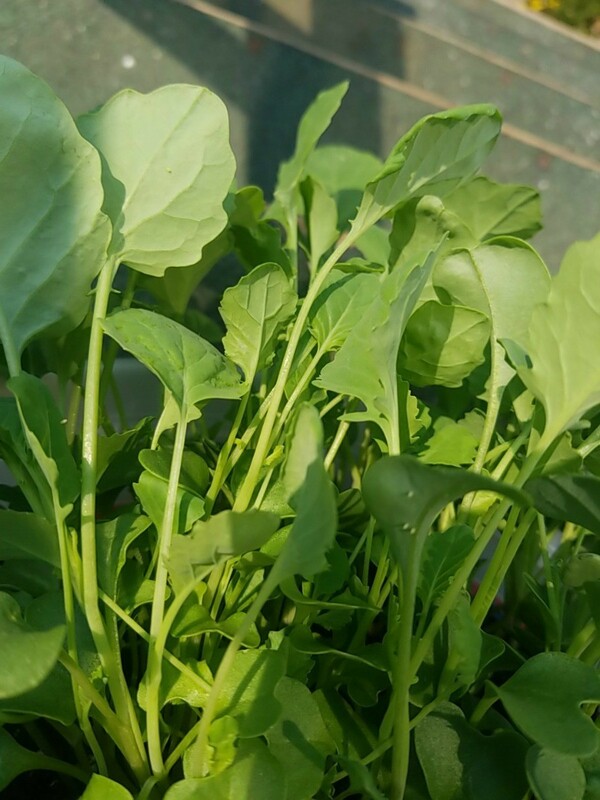 My vegetable plants have been very healthy overall and I check them every day for aphids, spider mites, etc. 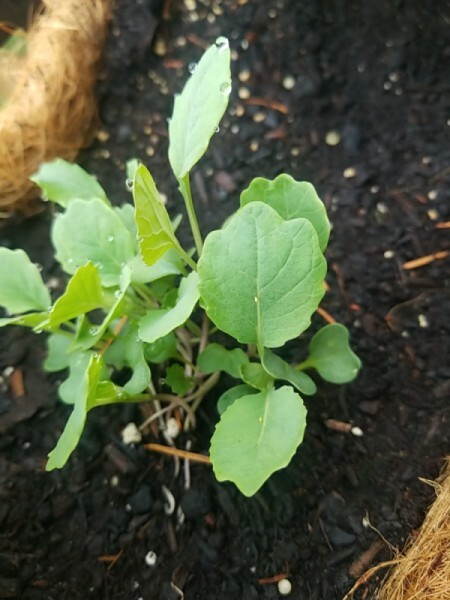 And out of nowhere one day one plant (broccoli I believe) had two or three of these little egg sacs? They look kind of like dead bits of a tapeworm parasite that has fallen off a dog or a cat. But they are stuck on the top of the leaf pretty tightly. 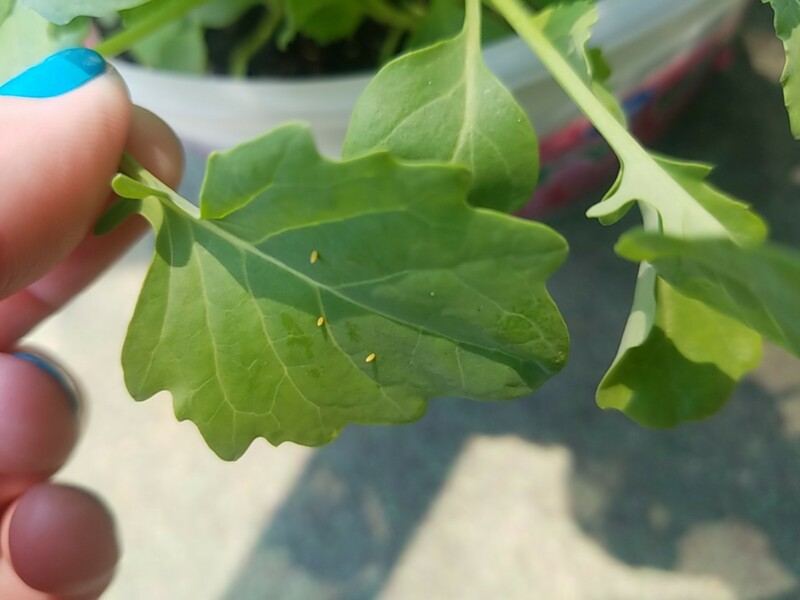 I've tried to look it up, but all the eggs look different with the bugs I've seen than the ones on my plant and are on the bottom of the leaf not the top. Could anyone please help me identify what these are? Also it started with just one or two and now there are a bunch, but not in clusters like most eggs. *update * on one plant they finally started showing up on the underside of the leaf, but only on one leaf the rest are on the top. I looked up the mealybugs but their eggs look cotton like. These little eggs/bugs things in the pictures don't move at all they are always in the same place and stationary which is why I assumed they were eggs but I have no idea what they could be. Tis the season for the creepy crawlies to surface! The pic is too small for me even magnified. Blurry it resembles midges, maggots, mealies or cutworms. I suggest that you scape some into a jar, seal it good and take them to the hardware store or garden center. They can give you a definitive ID and safe treatment method. Sorry I didn't realize the other ones loaded onto here blurry they were ok in my camera gallery. Here are a couple more pictures. I haven't been able take them to a gardening store yet and the hardware store cashier just kinda shrugged her shoulders. They are only on my broccoli, cauliflower and brussel sprouts. Not my cucumber, peas, tomatoes etc. And if location helps im on the Oregon coast. As far as natural insecticides go do you guys have any recommendations? It's my tablet that pix get blurry. I apologize. There are cabbage worms that eat the three you discuss and look like yours eggs and worms. They are destructive. There are some natural solutions described in the link. Hand picking was what we used to do (gloved and on an empty stomach cause it was icky). The suggestion to call your home extension is a good one as they know all the safe methods. They can probably confirm the I'd from a pic first! Good luck!! It's so disheartening when this happens.